Latymer Upper School is an independent, co-educational day school taking children from the age of 7 years old through to 18 years. Located in Hammersmith, the school was established in 1624 and has occupied its present site since 1890. In 1950, the A4 Great West Road was constructed bisecting the school. Linked by a private underpass, the north site became primarily for teaching whilst the south provided open space for sport and recreation. An indoor sports centre was opened in 1980 and helped the school establish a reputation as one of London’s finest sports schools. In September 2013, the Sports Centre Campaign was launched to raise money to upgrade the facilities. After seven months of intense fundraising activities which included baking, swimming, cycling, running, cooking, drinking, clay pigeon shooting, rowing, dancing, eating, selling and music making, they raised £4.5m. The new, recently opened Sports Centre is housed in a stunning glass fronted building and has a swimming pool with an adjustable floor, a large sports hall, fitness suite, and three studios. FT Leisure provided the pool’s water treatment and filtration systems and the moveable floor system for the 25-metre, 6-lane pool. 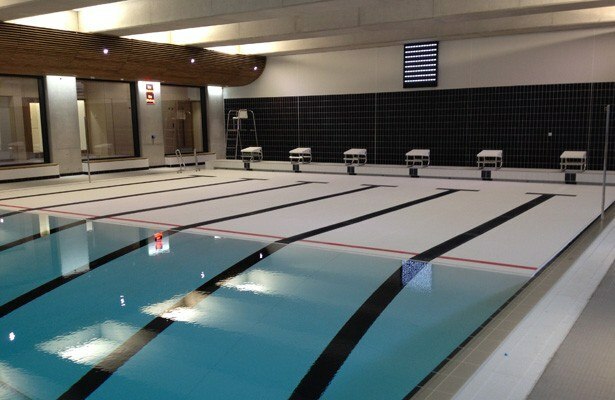 The moveable floor will allow a sub-aqua diving club for disabled people to use the facilities as well as providing optimum training conditions for the school’s competitive athletes. The main contractor for the project was Jerram Falkus Construction working together with architects FaulknerBrowns.